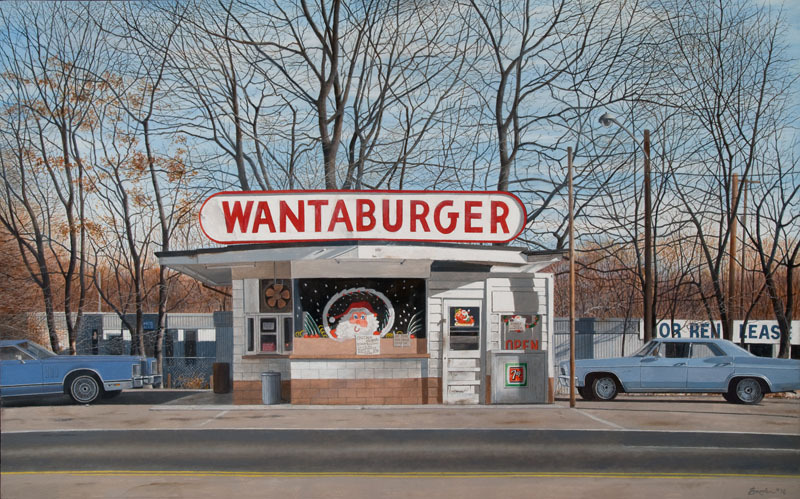 For more than thirty-five years, painter John Baeder's passionate interest in diners has led him to become the preeminent chronicler of this uniquely American form of roadside architecture. Critics have commented on his technical virtuosity, but he is a virtuoso with a purpose - creating a record of the architecture that surrounds the homely dining experience. This role as an historic preservationist sets him apart from his peers and identifies him as unique among contemporary realists. As New York Times art critic John Russell noted, "John lives, dreams, and paints diners. He loves diners, and it shows." It's not just the buildings themselves that he records with such care. It's the experience of these places that's of ultimate importance to him - the food, the stories, and the people. His greatest achievement lies not in what he records but in what he inspires: he doesn't just lead us to warm memories of better times, he evokes better tastes and smells as well. This isn't hyperrealism. This is magic. "Baeder: Pleasant Journeys and Good Eats Along the Way" captures that magic and places John's work firmly in the forefront of American painting today. 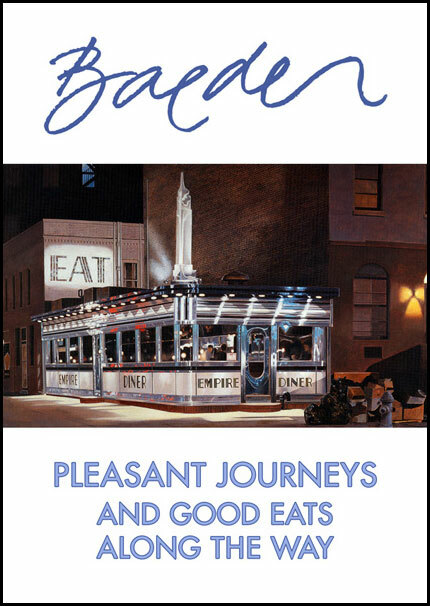 This DVD includes the 29 minute film "Baeder: Pleasant Journeys and Good Eats Along the Way" that was created in association with the Morris Museum of Art exhibit of the same name. Also included is a photo portfolio of 275 images tracing all the stages of Baeder's work, from the earliest postcard paintings to his more recent roadside images, as well as several photos of the artist. All three are featured in the DVD, with the story behind Big Boy Bop receiving considerable attention. What started as an idea for a John Prine album cover ended up with John Baeder owning his own Big Boy, which still lives in his back yard. 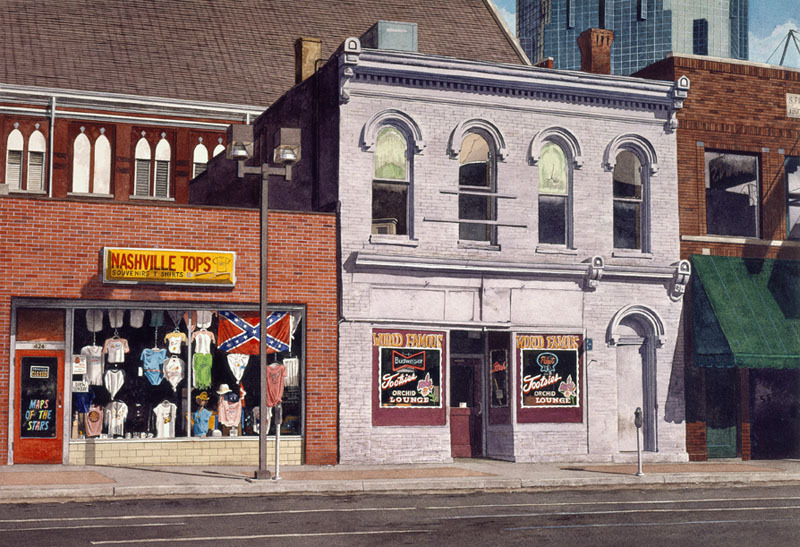 Tootsie's Orchid Lounge is a Nashville landmark on lower Broadway. The honky tonk's back door is directly across the alley from the back door of the Ryman auditorium. Tootsie's became famous as the place Grand Ole Opry performers would hang out between sets, especially if they were thirsty. Wantaburger was a huge hangout for teenagers, a drive-in of sorts, where a waitress would come out and take your order. The menu painted on the side of the building was enormous for such a small joint. Like many of John's subjects, it's gone now. For an additional charge, the artist will sign and personalize the posters.